My daughter loves to read. I mean, the girl LOVES reading. I mean she refuses to leave the house without a book. I’m talking about a kid who stays up way past her bedtime reading, every night, unless I remove all books from her room. I’m saying she burns through books like…I don’t know, but something that doesn’t last a long time. Even all the resources of both her school library and our city library cannot keep this kid in books. Please know I don’t say this as a criticism. I’m not mocking her. Oh no. Because my book-obsessed child is basically a mini-me in this regard. The bookworm does not fall far from the bookworm tree. She’s also a teensy bit obsessed with Harry Potter. She was Hermione for Halloween. She began planning her Hogwarts-letter 11th birthday party the day after she turned 10. She has a Harry Potter-themed shirt for every day of the week. And last week? I registered her for a Harry Potter day camp coming up this summer. She’s a big fan. But my daughter is also sensitive. And innocent. And, much to her great dismay (and the fantastic combination of tween attitude and gnashing of teeth), she was not ready to read the fifth Harry Potter book after devouring the first four. Despite her protests that she was the only kid in the fourth grade who hadn’t read all the Harry Potter books, I know I’m not alone in navigating the challenge of a tween who loves books and can read at a higher grade level than she’s in – or ready for. So just in case you have a kid who loves Harry Potter (but has already read them all or isn’t ready for the next book in the series) in your life, I’ve got a few other series that might keep your bookworm busy. The Land of Stories by Chris Colfer – Twins are transported to a fairytale land through a mysterious book. The stories are more Grimm than Disney, but still suitable for my fourth-grader who is reading the fifth book in this series (and loves giving me a play-by-play WHILE SHE READS. It’s fine. It’s great. It’s FINE.). Reportedly, a movie based on this series is in development. But since no cast, release date, or other news has been announced yet, you and your kids still have plenty of time to read the books first. Percy Jackson and the Olympians by Rick Riordan – It may be sacrilegious to Harry Potter fans, but this is my favorite middle grade series of all time. So when my daughter finally showed interest in this book about a boy who learns his father is Poseidon, an actual Greek god, I was super excited! And nervous. Would she love them as much as I do? Well, I won’t keep you hanging – she did. Because it’s the best series ever, said the totally unbiased and definitely cool mom. It really is a great series, though, with funny, complex characters who go on incredible adventures. And readers learn a whole lot about Greek mythology along the way. Sisters Grimm by Michael Buckley – This nine-book series about two sisters whose parents have disappeared and who learn that fairy tales are true begins light and gradually grows darker. Like with Harry Potter, parents may want to set the pace for their kids’ progress through these books. But also like Harry Potter and the other series I’m recommending, parents may enjoy them just as much as their kids! So reading them together may be a great option, as the messages of girl power and the strong bond between sisters enhance the clever nature of these fractured fairy tales. Story Thieves by James Riley – Life was pretty boring for Owen until he discovered his classmate Bethany could jump inside books and interact with the characters. The two students go on adventures in different types of books over what is so far a five-book series, and while reviews call these books more simplistic and clichéd, my daughter loves them. I legitimately just requested the fourth book in the series for her from the library. My 10-year-old still enjoys these books but they are geared toward a younger audience than these other series (which makes them a great alternative for kids who aren’t quite ready to advance to the next Harry Potter book!). Significantly different than the 2018 movie, this book captures readers and encourages them as well. I’m thrilled that my daughter wasn’t content to wait for me to read another chapter each night and has finished the first book on her own and begun the second. I looked up each of these books on CommonSenseMedia.org, and they are all suggested for readers ages 9 and above (except for Story Thieves, which is appropriate for kids 8 and up). This site also has a great guide for both the Harry Potter books and movies, if you’re unsure about what age is best for each of the installments in this series. You can watch a quick video here and read a more detailed guide here. It can be hard to hold our kids back from books that may be too intense for them, but it’s worth it. Reading the books when they can truly comprehend the storylines and handle difficult situations emotionally will protect their love of these books so they can enjoy them for years to come. And if taking a break from one series leads to interest in reading another, well, that’s just an added bonus as our kids grow into great readers who love all sorts of stories. As I was titling these images, I ran across these photos of our Harry Potter fans. They look so little, don’t they? I can’t believe how quickly time has been passing. Savor these reading moments with your kids because they, truly, are gone in a blink of an eye. Do you have any recommendations for a great kid series after Harry Potter? Feel free to drop your suggestions in this comments below! Mary Carver is a writer, speaker, and recovering perfectionist. She lives for good books, spicy queso, and television marathons, but she lives because of God’s grace. Mary writes with humor and honesty about giving up on perfect and finding truth in unexpected places on her blog, MaryCarver.com. 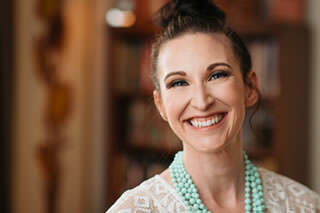 She is the author of Fast Talk & Faith: A 22-Day Devotional Inspired by Gilmore Girls and co-author of Choose Joy: Finding Hope & Purpose When Life Hurts. She is also a regular contributor to incourage.me and MothersofDaughters.com. Mary and her husband live in Kansas City with their two daughters.